With India having staked its claim as a major player in the world economy, the imperative is clear: the country will need innovative business leaders to help it navigate the tricky terrain ahead. 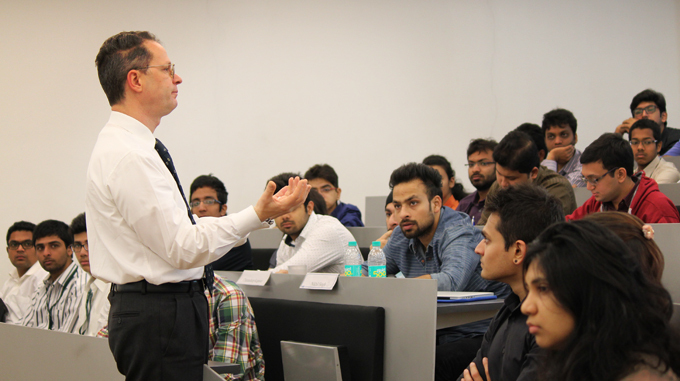 And while history reveals the trend of exporting domestic students in pursuit of premier international business school experiences, MISB Bocconi represents a new and exciting time for both students and business education in general: the presence of a world-class, international business school right here on the homefront. Wondering what makes the PGPB a truly global educational experience? Let’s take a closer look. No discussion of the PGPB at MISB Bocconi is complete without mentioning our extraordinary faculty. Shared with Milan’s premier international institution SDA Bocconi, our educators offer a comprehensive range of practical and academic expertise in all business fields. With degrees from top institutions in Europe, the U.S., and beyond, they have researched, taught, worked, and consulted at leading universities and organizations around the world, as well as published seminal texts in their areas of expertise. As if this alone weren’t enough, our faculty members are joined by prestigious visiting speakers from the world’s leading business houses. The result? An environment which not just exposes students to multiculturalism, but fully immerses them in it. Because the PGPB is a full-time dual campus program, PGPB students spent an entire semester in Milan at the Universita Bocconi campus. This experience is invaluable in terms of further enriching their international outlook while simultaneously helping them develop a global network of personal and professional connections which will last their lifetime. But the opportunities extend even beyond our dual campuses. PGPB students can also opt to participate in our popular Campus Abroad program in partnership with top schools from around the world. During this intensive three-week period, students attend advanced courses alongside their peers from MISB, SDA, and the host university. In addition to country-specific seminars related to the economy, social and cultural aspects of the host country, students also visit local companies and organizations with plenty of networking opportunities, as well. Destinations in 2015 for Campus Abroad programs include China, Singapore, Los Angeles, New York, and Tokyo. We can all agree that a successful career in today’s international economy depends not just on business acumen, but also on the ability to thrive within the increasingly multicultural environment. The mandate for an international business education has never been stronger. And that’s exactly what’s waiting for you with the PGPB at MISB Bocconi.